Antelopes constitute a fundamental part of ecosystems throughout Africa and Asia where they act as habitat architects, dispersers of seeds, and prey for large carnivores. The fascication they hold in the human mind is evident from prehistoric rock paintings and ancient Egyptian art to today's wildlife documentaries and popularity in zoos. In recent years, however, the spectacular herds of the past have been decimated or extripated over wide areas in the wilds, and urgent conservation action is needed to preserve this world heritage for generations to come. 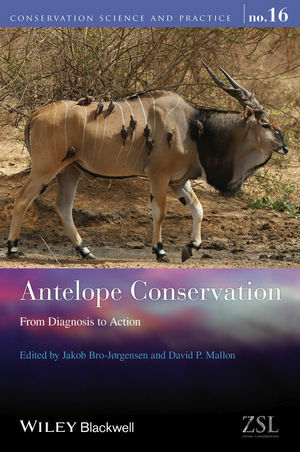 As the first book dedicated to antelope conservation, this volume sets out to diagnose the causes of the drastic declines in antelope biodiversity and on this basis identify the most effective points of action. In doing so, the book covers central issues in the current conservation debate, especially related to the management of overexploitation, habitat fragmentation, disease transmission, climate change, populations genetics, and reintroductions. The contributions are authored by world-leading experts in the field, and the book is a useful resource to conservation scientists and practitioners, researchers, and students in related disciplines as well as interested lay people. Jakob Bro-Jorgensen, Department of Evolution, Ecology and Behaviour, University of Liverpool, United Kingdom. David P. Mallon, Division of Biology and Conservation Ecology, Manchester, Metropolitan University, United Kingdom.